In nature, termites function as decomposers that breakdown dead or live wood that accumulates in and on the soil. 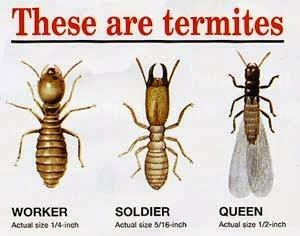 Termites are social insects and the makeup of the colony can be somewhat complex. The beneficial products of this breakdown process are returned to the soil as humus. We will discuss two different types of termites, the drywood and subterranean termites, and how to fix the mess they cause. These insects are the most destructive pests of wood, causing more than $1.7 billion in damages and cost of control each year in the U.S. alone. Their presence in structures is seldom noticed until damage is discovered or the termites swarm within the building. About 46 species of termites occur in the continental United States. The homeowner should be encouraged to enlist a exterminator to perform a McKinney Termite Inspection on their homes at least once or twice a year for signs of termite activity. Pay particular attention to additions such as porches or patios, and any area where wood contacts the ground. All additions to the house should have foundations that are pre-treated with a termiticide. Look for mud tubes, holes in wood with clean galleries cut across the grain, pellets or sawdust, piles of wings and swarming insects.